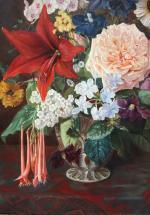 Artist: Joseph Schuster (Austrian, 1812 - 1890), attr to. 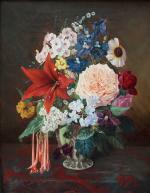 Masterfully still life with flowers was executed ca. 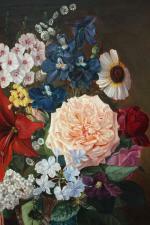 in 1850 and due to very close similarities in the manner and composition was attributed to the hand of important representative of Viennese Biedermeier Flower School, renown Austrian flower and landscape artist Josef Schuster (1812 Grätz by Troppau - 1890 Vienna). 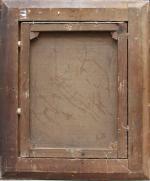 He studied at the Fine Arts Academy in Vienna by J.Mössmer, Sebastian Wegmayr and Franz Xaver Petter. 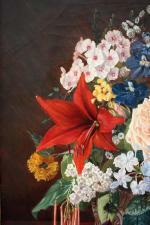 Since 1862 was a member of famous Artist Union "Wiener Künstlerhaus". 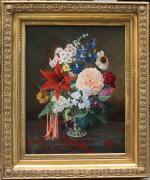 His flower botanical studies and classical still lifes broken him acknowledge among international collectors. Literature: Prof.H.Fuchs, Lexicon of austrian artists, Vienna, 1975; General Lexicon of the visual artists from antiquity to the present by Thieme/Becker, Leipzig, 1999.